The retailer looks like it's on the road to recovery, but there are speed bumps ahead that could derail it. The pace of recovery at J.C. Penney (NYSE:JCP) could be described as slow and methodical, though often it drifts closer to plodding and at times even seems to detour toward reversal. But the retailer seems to be heading in the right direction, with rising sales, spiking comparables, and a rosier outlook. Management has even raised the low end of its guidance. Yet investors are all too familiar with J.C. Penney's penchant for taking at least one step back for every one or two it takes forward, so it behooves them to keep an eye on developments that could send the retailer's stock reeling once more. 1. No need for a traffic cop. The bright spots in J.C. Penney's performance have been fairly consistent since it backed away from the financial cliff two years ago. Returning to the things its customers cared about most, such as predictable and pronounced sales and favorite house brands, allowed the department store to record its sixth straight quarter of positive (or flat at least) same-store sales, an important retail metric that shows organic growth in the business rather than higher sales due to expansion. But malls are enduring protracted declines in foot traffic that are hurting their tenants. In April alone mall traffic was down 10% as consumers shift to online shopping, which now accounts for approximately 8% of all retail sales. That shift is being felt at J.C. Penney, which has not recorded a quarter of positive store traffic since it began its turnaround. While its online channel is growing, and the retailer is facilitating that preference by expanding its ship-to-store policies (it will launch same-day store pickup for online purchases later this year), this will weigh down the results of its brick-and-mortar operations, which still account for the bulk of its sales -- and expenses. If store traffic doesn't turn positive soon, the company could close more stores beyond the 39 it announced earlier this year. J.C. Penney hasn't reported an annual net profit since 2010, and since then its long-term debt has grown from $3.1 billion to $5.3 billion, with net debt ballooning from less than $500 million to over $4 billion. 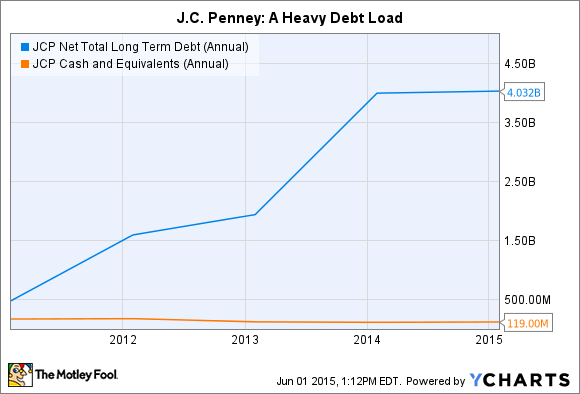 JCP Net Total Long Term Debt (Annual) data by YCharts. Sales, though, are markedly different from then. At that time it was still seen as a manageable situation. While Ron Johnson was brought in as CEO to correct the problem, only to ultimately drive the company off the rails, revenue remains 30% below where it stood five years ago. Revenue is rising again, but servicing its debt is a harder task now than it was even just two or three years ago. J.C. Penney doesn't have as much wiggle room, and another economic hiccup could push it over the edge once more. 3. Underinvesting in the business. The retailer has a capital budget of between $250 million and $300 million for 2015, $46 million of which it spent in the first quarter. That's almost half of what it spent in the year-ago period, and the full-year amount is about equal to what it spent in 2014. J.C. Penney says it doesn't have to spend as much money because, unlike rivals that are building out their omnichannel opportunities, it already has distribution infrastructure in place thanks to its long history as a catalog company. There is some truth in that, but it's equally true that J.C. Penney's is trying to conserve as much cash as it can at the moment and is likely deferring those expenditures until it can better afford them. If greater sales don't materialize, however, it could have problems paying for them, particularly given its heavy existing debt load. 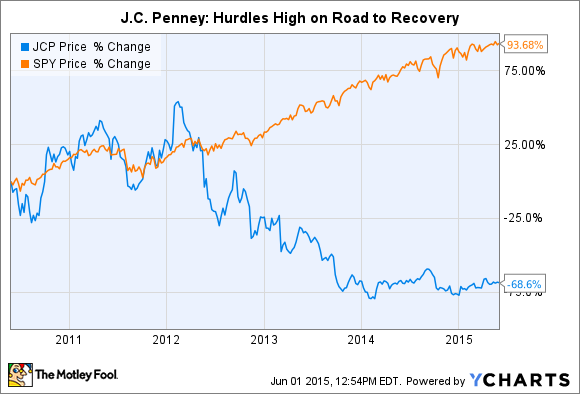 A troubled company is often rife with contradictions, and J.C. Penney is no exception. For all the hurdles it faces and the difficulties still to come, the retailer is making significant progress in its turnaround. Yet investors need to remember that even the best-laid plans rarely go exactly as intended, so the retailer still poses some risk. I've been fairly bullish about J.C. Penney and continue to believe there's much more upside risk than downside, but investors would be wise to keep in mind that things can go awry and send a stock tumbling.